The Government has just re-launched changes to tax and superannuation reporting obligations that will be delivered by Single Touch Payroll. This program is part of the Government agenda moving Australian business to digital record keeping, reporting and payment systems, and follows on from the widespread implementation of SuperStream for processing employer superannuation contributions. Single Touch Payroll will involve both the real-time reporting of tax and super information to the ATO when employees are paid, and online services for the registration of new employees. The critical question for super funds and administrators is ‘will the requirements be kept simple?’ The previous version was more complex, and I hope this version will reflect the need for much more simple requirements this time around. The Government previously launched Single Touch Payroll just after Christmas 2014, foreshadowing a mandatory service from July 2016. Following a backlash from businesses concerned about managing cash flows under the Single Touch Payroll regime, and concerns about the costs and difficulties in upgrading payroll and accounting software, the Government announced that it would review the program, and put a temporary stop on its deployment. The Government is committed to the re-launch having allocated $297 million to the Single Touch Payroll program in the 2016 half-yearly budget in December. They are however taking a slower and more staged approach to Single Touch Payroll deployment this time around. They propose voluntary transition to Single Touch Payroll reporting for employers with more than 20 employees commencing in July 2017, with it being mandated for these employers from July 2018. There should be a controlled and orderly approach to implementation, based on the extended SuperStream timetable. In SuperStream, rollover implementation preceded contributions implementation, where medium and large employers were on-boarded before small employers and SMSFs. This ramping-up and use of pilot programs meant that early lessons were continuously applied during implementation. A pilot has however been announced by the Government for small businesses (less than 20 employees) to see if Single Touch Payroll can demonstrate benefits for them. The pilot will take place in early 2017 with a report due by end 2017. The Government has not said that Single Touch Payroll will be mandatory for small businesses, but may review this after the pilot. This part of Single Touch Payroll will impact on super funds and their administrators as many employers are likely to move to harmonising contribution cycles with reporting, tax and income payment cycles. New employee onboarding initiatives, including the integration of TFNs, choice of fund and possibly account consolidation will also have administrative and strategic impacts on super funds. What’s more, the structure, content and configuration of this will have an impact on the decision that members make. A design workshop with all stakeholders, including the super industry, and consumer testing is critical to the success of the next step. The ATO will have support services (eg, online forms) in place by July 2016. These may be used on a voluntary basis by an employee or employer, and will supplement (not replace) paper forms. There is no plan to make use of online forms mandatory but it is almost inevitable they will become widespread. Under the new Single Touch Payroll information will be automatically reported to the ATO through its Standard Business Reporting (SBR) software. This is an extension of the whole of government SBR focus and in our past experience with SBR we believe that this is a welcome addition to the digital economy. Feel free to touch base if you have any questions. I headed to the AIST CMSF 2016 conference in Adelaide last week and once again a great event run by AIST. There was good representation from lots of players within the superannuation and wealth sector. Assistant Treasurer, Kelly O’Dwyer opened the conference delivering her welcome message via video from Canberra. Given the release of a discussion paper last week seeking feedback towards the government’s commitment to maintain the underlying goals for superannuation savings, it was a well-received message. “Enshrining the objective is not just about government, it is about framing our ongoing conversation about the purpose of superannuation and the value it retains and returns to an ageing Australian population,’’ O’Dwyer told the delegates at the conference’s opening. This was a common theme of the conference and I had many conversations with my colleagues on how the super system needed to be sustainable and reliable, together with a view on how retirees could improve their living standards. The focus on better retirement outcomes was touched on by all themes of the conference, and in particular I enjoyed the discussions centred on innovating, the customer and the ‘just do it’ undertone of these conversations. We are all seeking ways to deliver better outcomes to superannuation members, and during the conference there was lots of robust discussion on the intelligent design of services, product design, and investment strategy and policy participation. The sessions that centred on financial advice demonstrated this thinking well. It is well accepted that financial advice is an important part of the equation when it comes to a better retirement outcome for Australians. The way advice can potentially be delivered is rapidly expanding given the introduction of new advice platforms, integration into existing advice models and the adoption of new technologies. Conference attendees experienced a great demonstration of roboadvice and face to face advice in one of the plenary sessions. This example really highlighted to me that there are many services available today for superannuation funds to extend the value being delivered, and it’s up to the funds to look at how and why these services will be integrated into the outcomes superannuation funds provide to its members. The end result is that I also walked away from the conference with the belief that the ‘just do it’ approach to innovation is important. Starting to experiment and deliver on innovation starts with small incremental steps that involve changing the culture of an organisation, fail fast and fail quickly is a very real mantra that can support innovation and enable a new paradigm of technology, service and outcomes that we are seeking. The ‘Fear of Failure’ can override a great opportunity to do something brave, and this isn’t limited to technology. I know I feel refreshed and have picked up some new ways of thinking and am looking forward to putting them into play with our clients on how to produce a better retirement outcome for their members. At the end of his last blog, David Haynes posed the question, when will innovation overtake regulatory compliance as the major driver of change in superannuation? His answer is that it will only happen when we can improve the relationship between the two. Regulation should go hand in hand with innovation, and ideally mustn’t be separate or even in competing streams. The challenge for the industry and the Governments that regulate us is to get these two critical influencers into alignment, so that regulation actively supports the use of innovation. In this blog, I identify some potential actions that can be taken at both a high and at a more detailed level. The Financial System Inquiry (FSI) made some useful recommendations on innovation. Relevant to superannuation, the FSI called for better use of data, digital identity solutions, better public/private collaboration, improved payment system regulation and rationalisation of legacy products. We support the superannuation industry in progressing the progressing both big and small FSI initiatives as a priority. A good start could be with technological neutrality, leaving super funds free to adopt whatever technology is most appropriate to achieve the desired result. Lack of technological neutrality and new regulations that do not fully mesh between regulators – such as reporting and disclosure can add up to be a brake of technological change. Specific and inconsistent legislative requirements to use specific channels for reporting, including paper remain. Paper….yes paper. These also continue to be a brake on technological advances. We encourage the Government to begin an audit of these roadblocks, driven by a public commitment to the complete implementation of technological neutrality by 2017. The Government could also fast-track tasking the Productivity Commission with a review of access to data, another FSI recommendation. There is great benefit to the community from the Government prioritising the issuing of roadmaps for progressing all further issues arising from the FSI. While the Government’s Innovation Statement was largely silent on super, the Government has clearly made innovation a high priority. The superannuation industry should engage with the Government about using innovation to improve the operation and efficiency of the super system. A more efficient super system will result in super being easier and more hassle free for both employers and members. After all, SuperStream is a great example of innovation helping small business – all businesses – saving them money and making life easier. The road to ecommerce and common data standards could be characterised as slow and difficult for most of the super industry, and there were lots of false starts. Lack of first mover advantage, indeed first mover disadvantage became a potential issue. However, when the Government and especially the ATO got behind the program, it was able to be implemented for all employers and super funds. The financial and efficiency benefits are great – the benefits for employers alone are likely to be in the hundreds of millions a year. The Government is using this success story as a springboard for introducing other technological change. Single Touch Payroll, online enrollment of new employees, and improved member identification are already on the table and under development. But SuperStream can also be used to innovate and streamline other sorts of transactions – in insurance and investments, and for custodial services, for example. We look forward to the Government and the ATO commencing a consultation process with super funds and employers to coordinate and promote these initiatives, and to ensure they are structured to meet consumer and industry needs. There is understandable regulator caution about the risks inherent in some technologies, such as cloud computing and other shared computing services. This however has to be balanced by a holistic appreciation of the opportunities that the cloud presents. I believe APRA’s cautionary guidelines could further be balanced by further guidance identifying the member benefits that may flow from implementation of innovative technologies. It would be a great development if the next Federal Budget included provision for APRA to implement the previously announced but much delayed Data Dissemination Tool and improve the way in which APRA receives data – a new D2A. The Government could also require APRA and the ATO to work more closely together to rationalise the provision and use of data. Current overlaps, inconsistencies and different perspectives have resulted in inefficiencies and additional costs to super funds that the Government should actively seek to reduce. The other elephant in the room is the ongoing first-mover disadvantage associated with new technologies. Super funds are looking to improve member experience, improve members’ financial literacy and provide a better member experience – but a fund can move first in providing meaningful, innovative disclosure only to find their reward is having to dismantle the structure in order to meet new regulatory requirements. This year may see the first $100 billion super fund. The opportunity for it and other large funds to harvest scale benefits for their members is enormous, and should be encouraged. Leah is a Talent Acquisition Specialist listed in the Top 50 Social Recruiters list (AUS & NZ) by LinkedIn, with experience across Financial Services, Energy and Resources, IT, Consulting, Logistics, Sales and Marketing, and Healthcare industries. In her current role, Leah has partnered with business leaders to implement a proactive Resourcing function through social media and an employee referral program. What does a social recruiter mean? Being a social recruiter is about using social media to connect, pipeline, and engage top talent. With the use of LinkedIn Recruiter I am able to search for particular skill set that we know our client base needs now, and with our deep insight into projects let’s us build out possible contacts for skills we know we will need in the future. For instance at the moment we have a particular demand for all things digital and so I am liaising for those roles with potential candidates. How has this benefited IQ Group? Over the past 15 years IQ Group has built a leading reputation in the superannuation and wealth management space. We are known for our pragmatic approach to complex implementations and projects plus deep industry engagement in legislative and structural issues that affect the entire industry. We are known for delivering solutions that accelerate change and improve our clients operations and use of technology, from our team with strong domain experience and commitment to project delivery. Our activity and profile within the LinkedIn community let’s us reach candidates, clients and potential clients across a highly social platform. It is much more enjoyable for these targets to learn more about our culture and achievements hear what we are doing in the media, plus network with our specialists in the mainstream and specialist groups in LinkedIn. It is a highly professional experience for both sides. How do people engage with you socially? How do people refer other people to you? We always have our own team members networking for appropriately skilled candidates however you can reach me on LinkedIn. My details are there for easy reach. And if you are reading this and think you have a great candidate for either now or the future – just share my article. Why is IQ Group a great place to work? We have made a commitment to culture, skills and the right structure in our practice divisions, customer advocacy and assurance programs and educational offerings to put ourselves ‘out there’. Our commitment has seen us stay ahead of client requirements, anticipating what the next wave of innovation will be (digital is a great example of this) and we think it shows. And we cover off the core cultural rewards for being part of our team – staff benefits, flexible work practices, work/life balance, health and wellness programs, community volunteering programs as well as learning and development. Why is social recruitment part of the future? It certainly is part of the IQ Group future because of the transparency it provides to us as employers of specialists and for those potential candidates to learn more about us. We are firmly embedded into the industry culture of within groups and amongst general industry commentary on the LinkedIn platform and we only expect our commitment to strengthen. For more information you can visit our recruitment hub or contact us here. 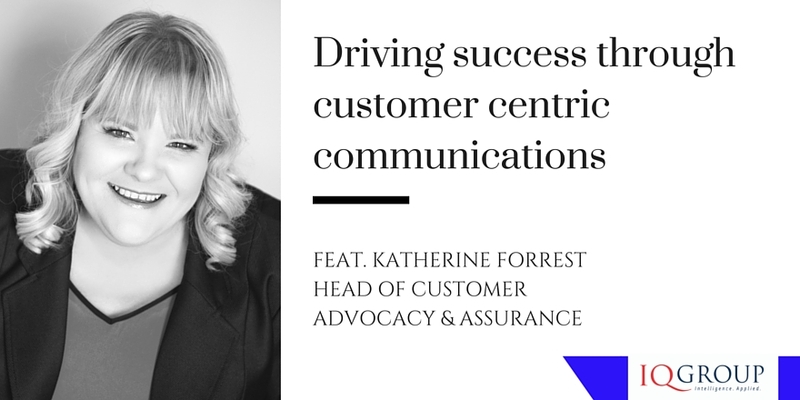 Katherine Forrest says to truly give credence to the voice to the customer; it takes more than collecting survey data and watching retention figures and financial returns. Listening means analysing every form of data and all aspects of member engagement. There’s a big difference between having the data and understanding what it’s telling us and what we can do about it. The superannuation industry has been distracted from its customer focus over the past two years as it has grappled with legislative change. With SuperStream and Stronger Super initiatives now bedded in, funds are returning to their member engagement programs with a vengeance. But what is really interesting is how the approach has evolved and matured. The focus is back but funds have moved on from “we know what customers need”. Today, there is commitment to genuine listening to what members want and “are we providing the right services at the right time in their lives”. Customer Advocacy, Voice of the Customer, Net Promoter Scores, and Customer Satisfaction Scores are the catch cries of a customer centric approach to driving business success in an ever changing market. Whatever metrics, formulas and frameworks you use, it is clear that the ability to listen and act upon the needs of your customers is vital to the success of business goals. Increasingly we look for ways to correlate the needs of our customers to the future direction of funds and wealth managers. Here are four of the building blocks to consider in the evolution to a customer centric organisation. Often the data and metrics captured in an organisation are used in isolation by different areas of the business. This results in siloed initiatives that don’t always drive the most effective outcomes. An effective Voice of the Customer Program links customer metrics with the financial and commercial metrics and helps a business prioritise ideas that are valuable to members. The insights given as relationships are built with customers are invaluable when considering the future direction of products and services within the fund. As a business collects data and learns to listen to customer feedback, it will inevitably review and improve its offerings. Targeted communications and marketing to customers ensures that the right products and services are presented at the right time to the right subset of, or individual, members. Understanding the key characteristics that drive the needs of customers and creating customer groups allows segmentation to drive the communication of services that are valuable to and valued by them. Building a customer centric organisation begins internally. It’s your own people who will make the difference. Look for ways to communicate the importance of building customer relationships and create a desire to go above and beyond. In my talking to funds about their current approaches, many are attributing customer satisfaction to not just taking feedback but spending considerable amounts of time and effort in taking the customers with them, in communicating what they’ve taken on board and the progression of enhancements. These loops are now driving communications strategies. The members are openly positive and satisfaction ratings are higher because customers feel that they’ve not only been heard and but know they’ve contributed to the improvement. Others have used customer research for changing product design. And as that research influences customer strategies, they are able to correlate success to their customer centric approach. It’s a good time for voice of customer to have resurgence and for the industry to be reshaped by it.